Saab cars were once the epitome of cool design. 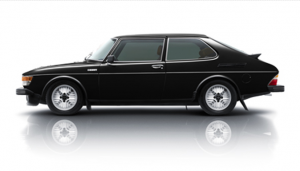 The launch of the Saab 99 Turbo marked the moment the Swedish carmaker became truly cool. During its lifetime, the Saab 99 had received regular upgrades, first a larger version of its slant-four engine, then fuel-injection to create the effective EMS sports saloon. However, in 1978, the Saab created a legend – the 145bhp 99 Turbo. It was an early adopter of forced-induction, and the fast but laggy 99 Turbo hit the market at just the right time – the second energy crisis of 1979 witnessed many people trading down from larger cars, and the seemingly economical new car offered all of the pace without the fuel consumption of the multi-cylinder opposition. 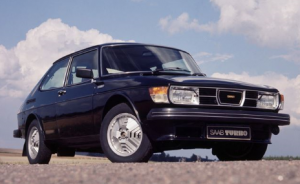 Saab launched its unexpectedly fast and highly desirable 99 Turbo in 1978. Here was the sporting four-seater of the moment, a car that made every driver, whether commuting to the office in Slough or scything through pine forests, something of a Stig Blomqvist, the rally driving champion. The Swedish company had reached its zenith at the same time as Abba dominated the charts and Swedish tennis player Björn Borg commanded Wimbledon. What could possibly go wrong? That year, I remember a south London greengrocer describing the virtues of a bottle of pickled beetroot to a dubious middle-aged gent. “Good? Swedish, mate!” Very nearly said it all. Sweden was the land of unmitigated quality. The following year, Curvin O’Rielly, a copywriter with the New York ad agency Ally & Gargano came up with the slogan “Saab: The Most Intelligent Cars Ever Built”. Given that these well-engineered, safe, aerodynamic and rally-winning cars were made by the same company – Svenska Aeroplan Aktiebolaget – that built the contemporary 37 Viggen jet, a superb fighter that could take off and land on forest roads – buyers of these distinctive, yet affordable cars had every reason to feel a little special, the dancing queens and back-handed champions of snow-brushed roads. Saab made very few different cars between the launch of its first – the teardrop-shaped, two-cylinder 92 in 1949 – and its divorce from the aircraft division and subsequent take- over by General Motors in 1990. From then on, something went wrong. The intelligence that had informed the cars, designed by Sixten Sason, whose highly considered work included Saab aircraft and Hasselblad cameras, faded. New cars were built on the platforms of commonplace Opels. Later GM Saabs were Subaru Imprezas and Chevrolet Trailblazers in lumpen disguise. Only the most gullible could believe the 2005 ad campaign screaming “Born from Jets”. Nor a model called Aero that had more in common, in terms of visual design, with a well known chocolate bar than a supersonic warbird. Last year, GM sold Saab to the Dutch sports car maker Spyker. It changed its name to Swedish Automobile and the company is now partly owned by the Chinese car distributor Pang Da. Rather surprisingly, though, today’s Saabs, as the comic stickers on 1970s 2-litre Turbos once proclaimed, are “Made in Trollhättan by Trolls”. Swedish, then, but only just.